When describing the path his life has taken, Michael Blake humbly refers to the words of his mother who remarked that the family had gone from “No House to The White House to the State House.” Blake has committed himself to public service and to the empowerment of others like him, who may not have direct access to opportunities to participate in the policy and political debates that shape this nation. Blake’s family story is a testament to his achievement. His family emigrated to the U.S. from Jamaica seeking new opportunities, but facing many new challenges. Michael Alexander Blake was born on Christmas Day at North Central Bronx Hospital with a heart murmur. Despite his initial health challenges, the namesake of two historic Jamaican public servants, Michael Manley and Alexander Bustamante, Blake was raised in the Bronx and continues to live a life rooted in the foundation of faith, politics and putting his heart and soul into all opportunities. Michael faced challenges from the start. His New York City elementary school, P.S. 79, is featured in Jonathan Kozol’s Savage Inequalities: Children in America’s Schools. Yet, he still rose to graduate from Northwestern University, making his story all the more remarkable. 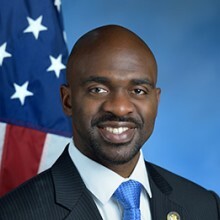 Michael Blake is the Assemblymember of the 79th District in New York State, representing parts of Concourse Village, Morrisania, Melrose, Belmont, Claremont and East Tremont. He is passionate about urban entrepreneurship, Minority- & Women-owned businesses, community learning, sustainable communities and empowering young men of color. Blake is also the Founding Principal of Atlas Strategy Group, which focuses on political and economic empowerment for communities of color. Michael recently served as the Director of Public Policy & External Affairs for Green For All, a national organization working to build an inclusive green economy strong enough to lift people out of poverty. Michael was also the Senior Advisor for Operation Hope, the best-in-class provider of financial literacy empowerment for youth, financial capability for communities, and ultimately, financial dignity for all. In 2013, Michael served as the Campaign Manager for Reshma Saujani for New York City Public Advocate. But before these opportunities of service, Blake’s path to public service is a testament of what happens if you just trust in your dreams, anything can be possible. While an Associate Producer in Chicago in 2005, Blake felt that he was not helping people in the ways he should be at the time. So, he interned twice a week for former State Senator Jeff Schoenberg (D – Evanston, Illinois). One day, a woman walked in in need as she was at risk of losing her home and only having a week to get the help. Because of what Michael witnessed from his humble beginnings, he and the team worked diligently to help the woman. She kept her home, returned to say thank you and then Michael knew that his path was clear – it was to serve the people. He considered several opportunities, but it was when Henry Tamarin (President, UNITE Here in Chicago) told Michael of the “Yes We Can” program that everything changed. Blake first met President Obama in 2006 when he joined the Obama organization as a participant in the “Yes We Can” political training program, which trained ten young Americans to run and execute a political campaign. Blake maintains that Obama was the same caring, intellectual and transformational individual at their first meeting that he is today as President and encouraged him to think beyond his present circumstance saying, “Michael, dream big dreams.” The dreams began to be realized when the Obama team sent Michael to Michigan to manage his first races. In 2006, Michael Blake successfully co-organized three state house campaigns in that election cycle and was promoted to become the Director of External Affairs for the Michigan House of Representatives serving in Michigan Speaker of the House Andy Dillon’s cabinet. In early 2007, following the inspiring launch of President Obama’s campaign in Springfield, Illinois, Michael was motivated to elect the first African-American President and left Michigan to join the presidential campaign in the ever so critical first step of the election process: the Iowa Caucuses. Michael served as the Iowa Deputy Political Director and Constituency Outreach Director for the Iowa caucuses. Shortly before the Iowa caucuses, a 2007 Time Magazine article said, “Michael Blake may have more to do with Barack Obama’s chances of becoming President than anyone besides the candidate himself.” Blake humbly disagrees. After the success of Iowa, Michael went to work in seven additional states concluding as the Michigan Deputy State Director/Political Director for the general election where all seven state campaigns of coordinated focus won. Following the campaign, Blake was named the Director of National Labor Outreach for the 2009 Presidential Inaugural Committee. Once completing that national assignment, he joined the White House staff as Associate Director of Public Engagement & Deputy Associate Director of the Office of Intergovernmental Affairs, coordinating African American, Minority Business and county and statewide elected official outreach. He created the White House Urban Entrepreneurship Summit series, which sought to foster public, private and not-for-profit partnerships and provide strategic advice to attendees. Blake left the White House to serve as the National Deputy Director of Operation Vote for President Obama’s 2012 re-election, the constituency outreach program for the Obama for America campaign and helped expand the diverse electorate who voted for President Obama including greater African American, Latino, women, youth, veteran, LGBT and Asian American participation. Following that successful tenure, Michael served as the Senior Advisor for the Office of Public Engagement for President Obama’s 2013 Presidential Inaugural Committee. lection and recognized by MSNBC in 2011 as one of the Top 10 Black Politicians on the rise. The Bronx, New York, native is a graduate of the Medill School of Journalism at Northwestern University. He is also an Exhorter in the African Methodist Episcopal Church and a Certified Lay Speaker in the United Methodist Church. During Blake’s first legislative session in Albany, he was able to pass four bills through both chambers on a bipartisan basis. These bills focused on quick pay for small sized Minority and Women Owned Business Enterprises, Criminal Justice reform and local government support during times of environmental disaster and recovery.